You don’t have to be the greatest soccer player or coach to be a Global Citizen withCoaches Across Continents. We are looking for the best people who can use sport for social impact and who will represent our organization On- and Off-Field. Before applying, please read our 2018Global Citizen Application Guide which is available on our website or by contacting . Your application is due a minimum of three months prior to your availability start date. If you are at universityand looking to be a Global Citizen during thesummer months, you are strongly encouraged to apply by January 1st and no later than February 15th. This is the bare minimum. Applications and spots are given on a first-come, first-offer basis assuming you meet our criteria. Trips to developing countries take months to plan properly when considering medical immunizations, passport and visa approvals, and other factors. Coaches Across Continents runs programs year-round and therefore accepts applications at any time. Applying to go On-Field with CAC is a long and detailed process, only to be attempted by those who take the opportunity to travel and use sport for social impact seriously. This could be the hardest and the most rewarding thing that you ever attempt, and most likely it will change your perspective on life. Everyone who works at CAC does so because we have a passion for making positive change in the world through sport (and traveling). Over 60% of our past Global Citizens stay involved with CAC Off-Field or go on a repeat trip at their next opportunity. Potential Project Countries could include any of the40+ existing countries we have partners in, plus new implementing partner programs in North America, South America, Africa, Europe, Oceania, and Asia. Please answer all questions in a DIFFERENT COLOR so it is easier to read. This is an intensive application on purpose. This experience could be life changing – so be thoughtful with your answers. QUESTION #1:Have you read our Global Citizen Application Guide (Yes/No)? How did you hear about Coaches Across Continents? Have you ever been cautioned, arrested or convicted of a criminal offense or are you currently the subject of a criminal investigation? Note: Many places we operate are rural communities in developing countries. Medical care is extremely varied from place to place and it will be essential to fully understand any potential issues prior to placement. Do you have any medical disabilities? Do you suffer from any pre-existing medical conditions? Have you incurred any major injuries or undergone any surgeries in the past two years? Are you presently or in the past two years been on medication? Have you ever had or been treated for a drug addiction or problem? Please answer this section honestly. As Coaches Across Continents continues to expand, we have incorporated some programs that require FLUENT speakers in order to properly serve our partner programs. What is your native (1st) language? Do you speak any other languages to any small degree? What are your strongest personal qualities? What would your best friends say are your strengths/weaknesses? Why are you keen on being a Global Citizen with Coaches Across Continents? 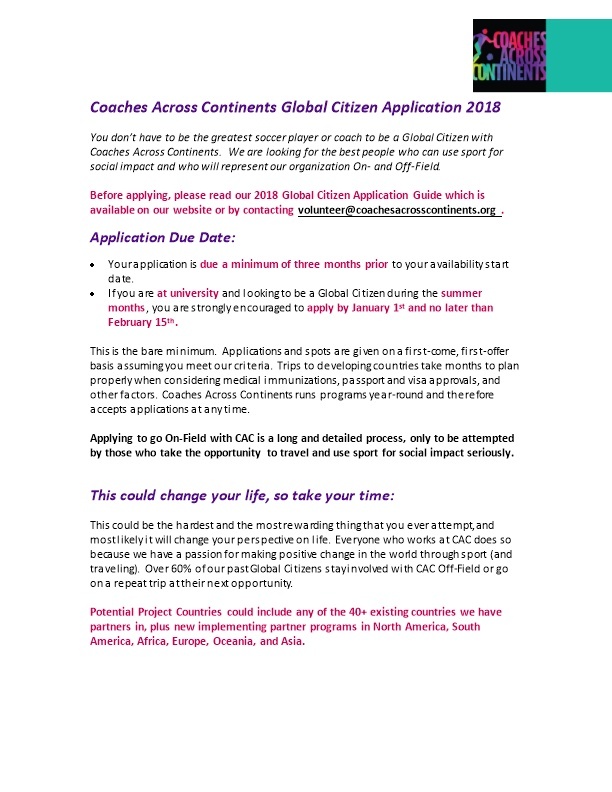 Please list the dates that you are available to be a Global Citizen with Coaches Across Continents in 2017. Be as accurate as possible (e.g. August 8th – September 20th). This is very important when we schedule partner programs. You will be matched with the community programs that are running during your available dates. Would you like to be a Global Citizen with CAC for the entire time you just provided above? If not, what is the total number of weeks you are willing to be a Global Citizen with CAC in the range you provided above? What is your favorite football team? Why do you support them? Have you ever been to see a men’s or women’s professional match (or national team match) in person? Tell us about it. In your own words, what do you think is the real power of football? Which country was your favorite and why? What is the biggest length of time you have been away from home? What is the longest amount of time you have visited/stayed in a single foreign country? What, in particular, keeps people from traveling to developing countries? What do you think will be your biggest challenges of living in a developing community? You will often hear the phrase T.I.A. (This is Africa) – or the equivalent in other continents/countries – as things almost never go perfectly to plan. How will you deal with the frustrations of late buses, noisy rooms, and the constant attention of local people and children in the community? For each of the next sections, you will watch a short (3-minute) video segment of our 2015 Documentary. After watching, please answer the questionsthat follow. What were your thoughts watching the above video? Why do you think Self-Directed Learning is important? Describe howyou think we use sport to create Self-Directed Learners? Why do you think some groups are against education in developing worlds? What stood out for you in this video? Why might these methods be effective in promoting gender equity? Why should boys and girls have equal opportunity to play sport? Why do you think boys get preferential treatment in most countries? Tell us about any experiences in your life regarding gender discrimination – whether involving you, a friend, a sister, another family member, etc. In 2015, 97% of local coaches knew a football game to give girls confidence to “have a voice” after working with Coaches Across Continents. What struck you most about this video? Why might these methods be effective in teaching about health? Why do you think that the highest HIV rates in the world are in Africa? Should Sport for Development educate about HIV or should we leave it to the medical world? In 2015, 92% of local coaches knew a football game to teach young people how to protect themselves from sexually transmitted infections, including HIV/AIDS, after working with Coaches Across Continents. Why might these methods be effective in teaching life skills? How would you respond if you witnessed a teacher or adult physically abusing a child? Elaborate on a life skill you could teach through soccer. Provide a specific example of an activity that could teach that skill. In 2015, 98% of local coaches knew a football game to teach young people to find creative solutions to their problems instead of asking for the answer after working with Coaches Across Continents. What is your favorite moment of the video? Why might these methods be effective in solving conflicts and promoting inclusion? Why do you think cultures all over the world discriminate against ‘different’ people? If children get into a physical fight on the field, what would you do? If coaches get in a heated verbal argument during a discussion, what would you do? Do you have any experience coachingor teaching other adults? If yes, please describe. What do you think is the difference between coaching children and coaching other coaches/leaders? Why do people resort to violence to prove their point of view is correct? 20% of all games played at a Coaches Across Continents training in 2015 taught about Conflict Resolution. Every Global Citizen is expected to raise funds for Coaches Across Continents prior to your trip. This is necessary to keep CAC sustainable. Please read the Global Citizen Guide for further explanation. The minimum amount that every Global Citizen must fundraise is $1,000. Your aim should be double what your trip is anticipated to cost. Upon completion of your trip, we allow volunteers to be reimbursed from a percentage of their fundraising efforts. You may receive full or partial reimbursement for the following travel costs: airfare, visas, immunizations, and lodging. The reimbursement amount depends on your fundraising. understand that unforeseen situations become inevitable, an enormous amount of time and effort goes into the organization of our programs and theGlobal Citizen schedules supporting them. Please refer to the Global Citizen Guide for further explanation. Global Citizens sometimes also pursue outside grants, which help them to cover their personal travel. This is fine and encouraged, but these candidates are still expected to fundraise for Coaches Across Continents so that we can continue our great On- and Off-Field work 365 days of the year. If you qualify for a grant, the expectation is that your fundraising minimum remains at $1,000. Have you had any past experiences fundraising? What was your target amount? How much money were you able to fundraise? Please give three separate ideas on how you plan to raise funds for CAC? Please describe these ideas in detail. Being a Global Citizen with Coaches Across Continents is more than a one-time on-field experience. During your initial fundraising process you should convey two messages to donors. The first being that we will send weekly updates throughout your travels, including a photo, stories, and statistics on the impact you are making. Secondly, donors should know that at the end of your trip they will be sent a trip summary, with more content on what we do, how their donation made an impact and ways to stay involved. Upon your return, we encourage Global Citizens to stay involved in anyway they are capable. Sharing the CAC legacy through social media channels (Facebook, Twitter, our blogs, etc. ),presenting to groups of potential future volunteers (i.e. sports teams, service groups, etc), finding potential Global Citizens through personal network, ect. What groups or organizations can you do a presentation for Coaches Across Continents with the aim to raise our profile, engage future Global Citizens, and potentially connect us with future fundraisers? Do you have any friends who have expressed an interest in being a Global Citizen and traveling with CAC? Please provide their name and email so we can follow up with them! Please list two references and their contact information. Please notify them that we may reach out to them in the near future. Why have you selected this person as a reference? Paste here! We may use it on our website if you are selected as one of our Global Citizen coaches. Begin your fundraising efforts! Again, every Global Citizen is expected to fundraise a minimum of $1,000 – and the target goal is twice your anticipated costs.Fundraising is important. Without visible progress towards your fundraising goal, your place in the program may be discussed or put on hold. For full details please read our Global Citizen Guide. Begin planning and packing! This is your Global Citizen experience of a lifetime!